A deck building game about an epic struggle over the imperial succession! The great emperor suddenly passed away. There are seven successors! Who will save the empire from chaos?! 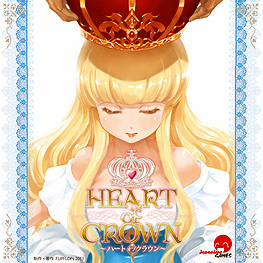 Heart of Crown is a deck building card game. Each player starts with the same deck, but over the course of the game you will build up your deck with the aim of achieving ultimate victory: getting your princess on the throne. Each player starts with a deck containing meagre holdings and unreliable followers. Start raising taxes from your territories to acquire more land and followers to make your deck stronger. When your deck is strong enough, it's time to back a princess! Once you back a princess, she'll come to your aid with her unique ability. However, when it comes to backing princesses, it's first-come first-served. You've got to act before your rivals claim the princess that you want. Act fast, and aim for the coronation ceremony! Box features room for Far East Territory and Northern Enchantress expansions, as well as counters, dividers, and randomiser cards.